So yesterday we wrote about a South Africa messaging startup called Zing. To understand what it is, just think of WhatsApp, but with the other stuff you’ve wished it had, like marketing capabilities for businesses and news inside the app. Last week, they signed a sponsorship deal with one of Zimbabwe’s top Premier Soccer League football clubs, Caps United. We were skeptical earlier about a little known messaging startup sponsoring a football club so Glenn Pheasant, part of the team at the startup, got in touch and we did a quick QnA over email. Techzim: What is the unique selling point for Zing right now seeing WhatsApp and to a lesser extent, WeChat, have a hold on the market. Glenn: We are cheaper to download, Zing being 1.3 megs to download, and is Very cheap to run, if you send 600 – messages (not pictures) a day, for the whole month that will add up to 2 megs of data a month. That is under a $1 a year to have communications. Zing can work on phones that others app do not. See attached for stats a month ago. 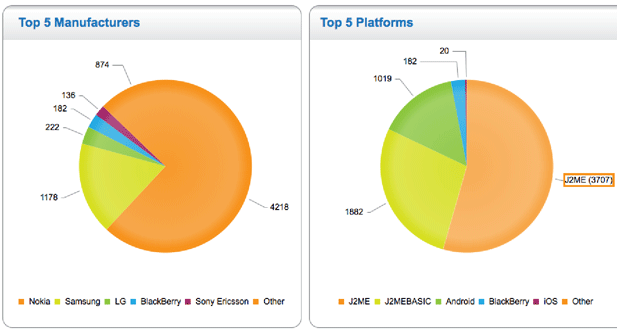 You can see that most of the users are on the J2ME and J2MEBASIC,. We can also personalise ZONES – here companies can create ZONES and talk to their followers – we can send them links and even do Feedback and competitions. We are looking at the commercial aspects of the business, for companies that want to get personal with their clients. The IM is an added bonus. We also wanted an App for Africa made by Africa. Download zing for yourself now and press the “Quick add” type in “1973” ( the year Caps was founded) and you will now be in the Caps United Zone. Pretty much a combo of other IM and Social media platforms. Glenn: The developers of the IM have a long list of Blue chip clients, that need to develop Apps for a wide range of Phones, and they used Zing to gather and test the apps, so it was an IM designed to help them understand the way phones work with the Apps they Produced. They did a soft launch and got great numbers, but just let in run and did no marketing. This where we come in. we have now done a re-shape Zing and now happy to take it to market. We waited for the Launch of the New iPhone and the other phones in December before we did the re launch. TZ: Any numbers for us… downloads by Zimbabweans etc…. Glenn: We have about 20 000 users in Zimbabwe. TZ: Which other markets is Zing focusing on? Glenn: At the moment we are looking at a few strategies in South Africa – Zimbabwe – Ghana – Swaziland and Nigeria but the app is available around the world. Glenn: We know how Africa works, we have been in Broadcasting for the last 15 years. We know how important football is the the people, but we also know that there are limitations due to costs of watching a game, or even going to a game. We want to interact with the people in the stadium and outside. That is why through Zing you will be able to choose man of the Match voted by you the Public. Once again we want to personalise Caps United with its followers. TZ: Does Zing have football management capability? Glenn: We have run successful businesses, and we believe that if the Club is run like a business, we can change the negativity that followers managements of football clubs. I am not saying it is going to be easy, but we want the normal person on the street to be able to communicate with a club he loves. All in all, they reminded us of BiNu. BiNu did news inside the app as well, and their main selling point was that it was the lightest app that ever existed in terms of data usage. We don’t know yet how biNu’s come-back has been, but we know WhatsApp is ruling like never before and we don’t see that changing. What would probably had made sense was maybe to create a Caps United version of the app that fans would just install because it’s their team’s app. The zones sound complicated, and Zing themselves are not pushing the free airtime anymore, which just means less attraction. The latest on Telecel’s prospective owners: Who is Native Telecoms?